Not to be confused with periodic mapping. "Period length" redirects here. It is not to be confused with Repeating decimal. "Aperiodic" and "Non-periodic" redirect here. For other uses, see Aperiodic (disambiguation). In mathematics, a periodic function is a function that repeats its values in regular intervals or periods. The most important examples are the trigonometric functions, which repeat over intervals of 2π radians. Periodic functions are used throughout science to describe oscillations, waves, and other phenomena that exhibit periodicity. Any function that is not periodic is called aperiodic. for all values of x in the domain. A nonzero constant P for which this is the case is called a period of the function. If there exists a least positive constant P with this property, it is called the fundamental period (also primitive period, basic period, or prime period.) Often, "the" period of a function is used to mean its fundamental period. A function with period P will repeat on intervals of length P, and these intervals are sometimes also referred to as periods of the function. Geometrically, a periodic function can be defined as a function whose graph exhibits translational symmetry. Specifically, a function f is periodic with period P if the graph of f is invariant under translation in the x-direction by a distance of P. This definition of periodic can be extended to other geometric shapes and patterns, as well as be generalized to higher dimensions, such as periodic tessellations of the plane. A sequence can also be viewed as a function defined on the natural numbers, and for a periodic sequence these notions are defined accordingly. (see the graph to the right). Everyday examples are seen when the variable is time; for instance the hands of a clock or the phases of the moon show periodic behaviour. Periodic motion is motion in which the position(s) of the system are expressible as periodic functions, all with the same period. For a function on the real numbers or on the integers, that means that the entire graph can be formed from copies of one particular portion, repeated at regular intervals. ; both functions are periodic with period 2π. 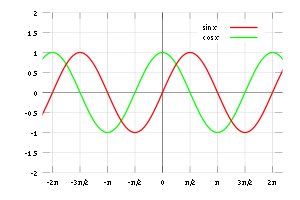 The trigonometric functions sine and cosine are common periodic functions, with period 2π (see the figure on the right). The subject of Fourier series investigates the idea that an 'arbitrary' periodic function is a sum of trigonometric functions with matching periods. According to the definition above, some exotic functions, for example the Dirichlet function, are also periodic; in the case of Dirichlet function, any nonzero rational number is a period. One common subset of periodic functions is that of antiperiodic functions. This is a function f such that f(x + P) = −f(x) for all x. (Thus, a P-antiperiodic function is a 2P-periodic function.) For example, the sine or cosine function is π-antiperiodic and 2π-periodic. While a P-antiperiodic function is a 2P-periodic function, the inverse is not necessarily true. where k is a real or complex number (the Bloch wavevector or Floquet exponent). Functions of this form are sometimes called Bloch-periodic in this context. A periodic function is the special case k = 0, and an antiperiodic function is the special case k = π/P. is a representation of a 1-periodic function. Consider a real waveform consisting of superimposed frequencies, expressed in a set as ratios to a fundamental frequency, f: F = [f1 f2 f3 ... fN]/f where all non-zero elements >= 1 and at least one of the elements of the set is 1. To find the period, T, first find the Least Common Denominator of all the elements in the set. Period can be found as T = LCD/f. Consider that for a simple sinusoid, T = 1/f. Therefore, the LCD can be seen as a periodicity multiplier. For set representing all notes of Western Major Scale: [1,9/8,5/4,4/3,3/2,5/3,15/8] the LCD is 24 therefore T = 24/f. For set representing all notes of a major triad: [1,5/4,3/2] the LCD is 4 therefore T = 4/f. For set representing all notes of a minor triad: [1 6/5 3/2] the LCD is 10 therefore T = 10/f. ^ For some functions, like a constant function or the indicator function of the rational numbers, a least positive period may not exist (the infimum of all positive periods P being zero). Ekeland, Ivar (1990). "One". Convexity methods in Hamiltonian mechanics. Ergebnisse der Mathematik und ihrer Grenzgebiete (3) [Results in Mathematics and Related Areas (3)]. 19. Berlin: Springer-Verlag. pp. x+247. ISBN 3-540-50613-6. MR 1051888.